We're excited to announce a new integration between Zendesk Support and Slack. Zendesk and Slack have been collaborating on this product to deliver the best experience to our shared customers. Ticket notifications in Slack. 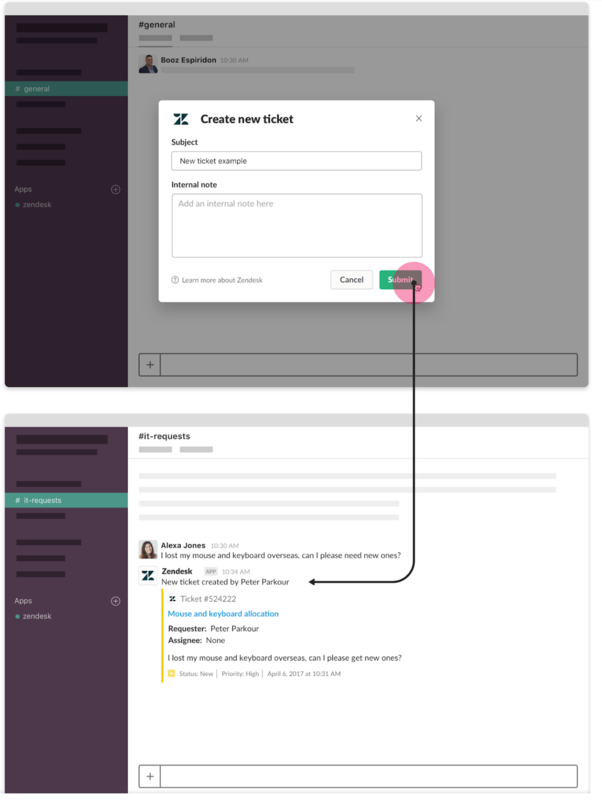 Slack users can see information about Zendesk Support ticket events in specified Slack channels. High-level ticket information is displayed (subject, description, priority, assignee, requester, and creation time). Channel configuration. 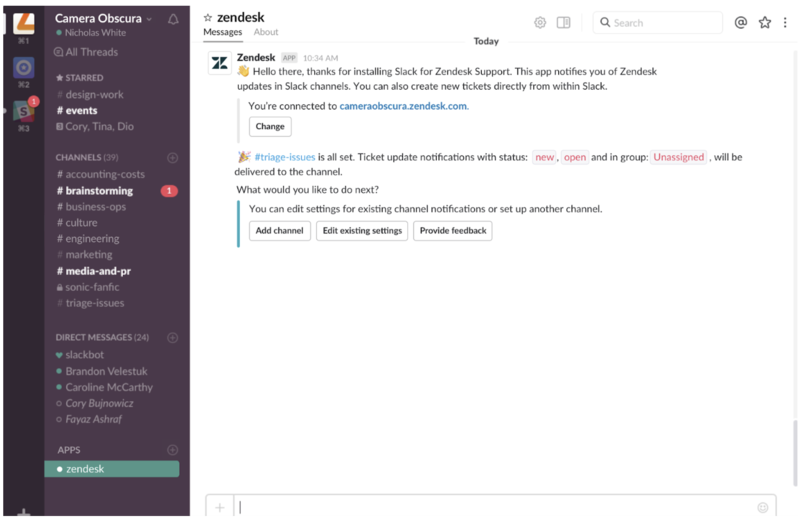 Slack admins can map Zendesk Support groups to Slack channels. This allows tickets to be routed to the right channel. Additionally, it is possible to choose the specific ticket event types to display in Slack, reducing noise and letting admins prevent sensitive data from being posted in Slack. Creating new tickets directly from Slack. This feature is designed to cater to an internal use case where Slack users want to raise a new Support ticket directly from Slack, which they can do using a message action or slash command. Commenting on existing tickets. 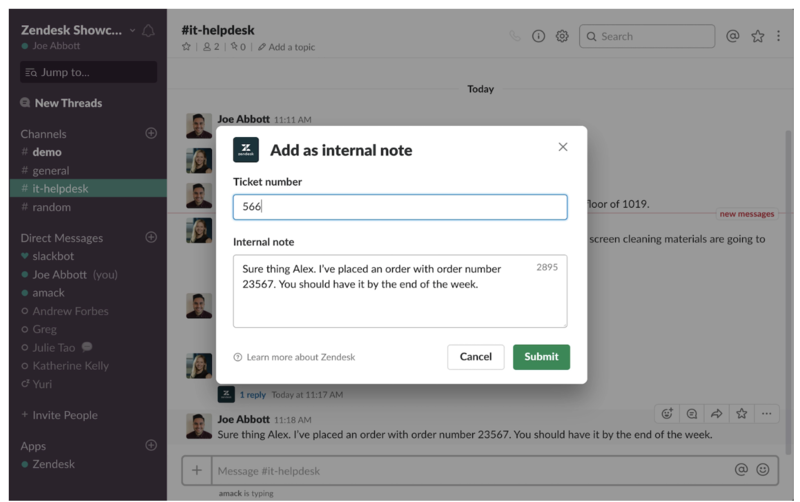 Users can add an internal note on existing tickets from Slack using a message action. Simple installation. The new integration’s installation process is much simpler than the previous integration (built by Slack). Only a single authentication to Zendesk Support is required. Does this require the paid version of Slack? Thank you in advance! I was so excited to see a post saying that the Slack integration had been updated. But it is still far from hitting the mark. You still have limited control over what tickets to include for notifications. I would rather be able to control what is added down to the ticket type so our channels aren't getting flooded. 1. We don't want ALL tickets posted, but it would be great if you could only have problem tickets posted, or only tickets with 'urgent' priority. As you're then getting meaningful content in these channels. 3. and this is the biggest. You can not collaborate with your team in slack when you need assistance on a ticket. It would be great if you could type /zendesk #12345 and it post the referenced ticket into slack so that your team can assist with an issue. Instead, we still have to post links that open a fresh Zendesk window or have to copy and paste ticket numbers. It's great to see you working on this product, but still feel that it is pointless and we will have to continue using webhooks to get basic function. Thanks for sharing your feedback, Sheldon! I'll be sure to pass it along! Welcome to the Community, Erin! I'm so sorry for the delayed response. I double checked our documentation on installing the new Slack integration, and it doesn't look like a paid Slack account is required to use it! Where would you like bug reports sent to for this integration? Thanks for asking. Bug reports should be sent to support@zendesk.com. Hello! Can you reply to tickets in Slack with existing macros? I think the BubbleIQ Zendesk Slack integration might be able to help! @Sheldon our integration is built based on fully customizable targets and triggers. So you can put conditions on triggers such as urgent, if it is a problem ticket, etc., and map that to a channel in Slack. @Samantha we recently (yesterday!) announced support for running Zendesk Macros directly from Slack. BubbleIQ is available in the Zendesk App store and you can install it here: https://www.bubbleiq.com/zendesk-slack-integration. We're adding new features weekly so happy to help with any other ideas you have! I just installed the Slack/Zendesk integration and had a question about sending specific updates to specific agents. Rather than have a main channel that shows ALL updates, I would like an agent in zendesk to receive a personal update/desktop notification in slack, when they are assigned a ticket, or there has been an update to a ticket that is already assigned to them. Is this something that can be accomplished easily in the integration? in my case all slack users are agents so it works. Let me know if this works for you & any feedback is more than welcomed. Thanks for jumping in to help out, Catalin! I'm not sure this is the right ticket, but is there a way to integrate slack with zendesk help that when you post an article, you can toggle it to post an update/message via a slackbot in a specific channel? My team currently post user feedback in Slack and I am trying to define a process where we start logging it in Zendesk instead of Slack so we can aggregate it and report off of it a lot easier. Several team members in other departments have grown accustomed to seeing the real-time feedback in Slack and want this to continue. I am thinking about creating a custom field in ZD and working on an integration to get the feedback from the custom ZD field to auto-populate in a Slack channel. I am rather new to ZD and we don't have a ZD admin. Does anyone have any recommendations on the best way to build this? Any and all feedback would be greatly appreciated. Is there any way to make a rule to exclude some tickets sending to Slack? Currently, there is only one option to ignore the group. I need to exclude the ticket by custom field or integration channel or tag. In the Slack trigger, you can add conditions to check for ticket attributes like "Ticket:Tags contain none of the following......" or "(Custom Ticket field) is/not XXXXXX" so that the Slack trigger will exclude tickets unless they match all conditions for the trigger. If you would like additional help in reviewing your account triggers, feel free to email us at support@zendesk.com and we can get more account specific information to assist with adjusting your business rules to comply with your intended workflow. This item is required by an installed app on your account, so it cannot be modified. Anyone have any help for the issue above? The Slack trigger that's created automatically when you install the app cannot actually be modified as mentioned in our documentation here. If you want more control over what conditions are set through your Slack trigger you can instead use an HTTP target which I've attached for you here.